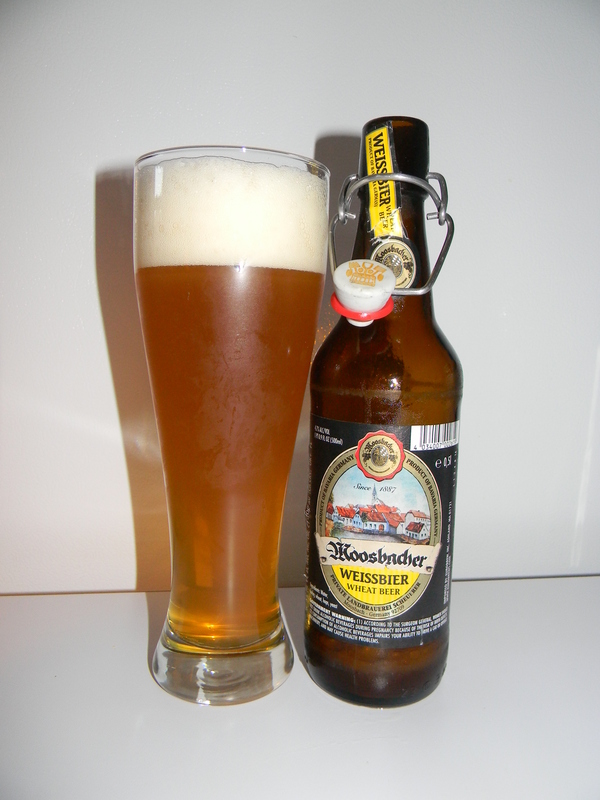 Review of Moosbacher Weissbier | Beer Apprentice - Craft Beer News, Reviews, Interviews and Info. Hi guys. For today’s craft beer review I’m going to be trying the Moosbacher Weissbier produced by Private Landrauerei Scheuerer located in Moosbach b. Vohenstrauss, Germany. I don’t know much about this brewer and I have yet to try a brew from them, so I’m pretty excited to see what we have in this bottle. Let’s check on the website, moosbacher.com, and see what kind of info we can find. Smooth bitter, fine filtered, very bright colour, with finest Bavarian hops. Well, not much to go on there, so let’s just get it poured and find out for ourselves. This brew came in a 16.9 oz. bottle with an ABV of 4.7%. It poured very hazy with a lot of sediment seen floating around. It was a deep orange color with some brighter yellow highlights around the edges and the bottom of the glass. The head was white, fluffy, billowy and soft. The size was more than adequate and the retention time and the lacing were both very nice. The nose released proper hints of wheat as well as a ton of yeast. Spices of clove and coriander commingled with fruity banana and dollops of grain. The fragrance also provided just a wee bit of that “bubblegum” aspect that I really enjoy in wheat beers. Not bad at all with this bouquet I didn’t think. The taste provided a lot of yeast and wheat. They were easily the most dominating aspect. More of the clove and banana too. The graininess was accounted for again, however it was just a compliment and really pulled the flavor together in my opinion. Overall, I found it to be simple and to the point, but good. The mouthfeel was medium bodied. Smooth, crisp, refreshing, thirst quenching and a touch dry. It had some really nice carbonation, which left an ok amount of flavor behind after each gulp. All in all, I thought this to be a very nice beer. Nothing out of the ordinary or over the top, yet solid and true to the style. The drinkability was great and I, of course, think this would make for a great warm weather brew. I’d say give the Moosbacher Weissbier a try if you are searching for a sturdy, no-nonsense Weissbier to enjoy without having to think about it too much. Feel free to leave me a comment if you’ve tried it and tell me of your opinion if you’d like.